1. Traditional pain drawings are 2-dimensional line drawings which typically are comprised of an anterior and posterior body diagram. 3. Clients should be given tools to communicate pain that is deep within their 3-D bodies. 4. The current limitations of the traditional 2-D pain drawings is unknown. 5. Research is needed to determine if a 3-D pain drawing has greater utility, validity, sensitivity and specificity. 6. Below is a rather crude model of a "3-D" pain drawing and it is anticipated that it will undergo several permutations. I believe that it needs to be simplified and put on 1 page for ease of use. I do think that all 3 planes of the body need to be represented. 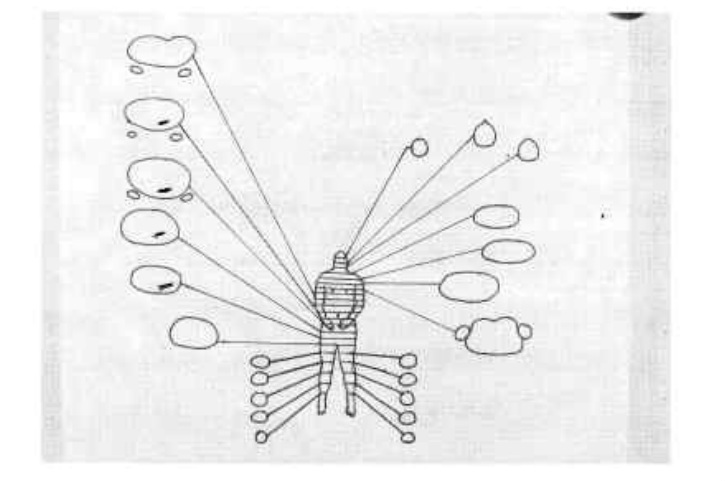 It is not a true 3-D holoraphical image, but rather addresses all 3 cardinal planes of the body individually, such that the totality of all 3 is considered "3-D". 7. Not all clients/patients are computer savy and therefore a computer model of a 3-D pain drawin has some drawbacks. Making a computer available for clients to fill out a digital pain drawing poses some limitations. Of course there may be many advantages. The easiest application would be a 3-D drawing that is on a piece of paper. 8. It is hoped that others will be inspired to develop this concept and help it to become a tool that will help patients communicate more effectively with their medical practitioners. My goal is to introduce the concept, I lack the artistic skills and other skills and resources necessary. 9. In time a computer model may be available that will greatly surpass (though maybe not replace) this 3-D drawing. The digital media may have greater accurracy of representing 3-D anatomy. Unfortunately, I do not believe that this product is available for use yet, and I cannot find any additional information. Specificallly, I do not find any references past November 2009.I sent the author an email, but so far no reply. Here it is and let's hope that this project does come to fruition. I cerrtainly do not have the resources to facilitate it. This was due to a severe motorcycle wreck in 1974, enhanced with bone removal in 2000. For a fusion and two hyperextension injuries 2000. In 2007 a triple Neurectomy was ver successful in resolution vexacious pain. Would a 3-D pain drawing have hastened appropriate diagnosis and appropriate was elusive and frustrating, especially as pain was very limiting regarding physical activities. Example of how the 3-D model adds clarity to deep pain from traumatic peripheral Neuropathies: Ilioinguinal, Iliohypogastric, Genitofemoral. TRANSVERSE, SAGITTAL AND FRONTAL IMAGE SLICES SHOWING DEEP NEUROPATHIES WHICH BECOME SUPERFICIAL Would a 3-D pain drawing reduce early error in diagnosis? The following paper does support the belief that the topic is relevant. I am aware of some cases of tumors in the proximal femur that were initially dianosed as musculoskeletal sprain/strain. Perhaps a transverse image of the femur with deep demarcation would serve as a yellow or red flag at first glance, as opposed to a superficial marking. Dr. Parsons, along with musculoskeletal oncologists Kristy L. Weber, MD, Denis R. Clohisy, MD, and Frank J. Frassica, MD, offered advice on evaluating and managing lesions to avoid common errors at a symposium held during the 2008 AAOS Annual Meeting. Errors include delayed diagnosis, misdiagnosis, and inappropriate removal of malignancies. Pain drawings (PD) are a basic part of medical charts used by the medical community, including Physical Therapists. The PD allows the client to communicate their subjective experience of pain and altered sensation in a graphic manner. The PD is a 2-dimensional (2-D) image using a line drawing of the body in an anterior and posterior (A& P) view. A question arises as to whether or not clients would communicate more effectively if given tools to represent deep, 3-dimensional (3-D) pain (P). It is presently unknown whether or not there exists a bias towards initially viewing P as superficial, segmented, and Dermatomal when using 2-D PD. Empirically, the author notes 2 areas of deep and expansive spinal and neuromusculoskeletal P that cannot be expressed adequately using 2-D PD. One is C3 neuropathy which covers vast, deep, sensory territory in contrast with C1-2, C3-8 neuropathies. The other is traumatic neuropathies involving 3 separate nerves that traverse the abdomen and inguinal canal. Would a 3-D PD give better representation of these examples and of sclerotomal, visceral, and sympathetically mediated pain? Are there areas of the body that require 3-D versus 2-D, such as a psoas abscess (deep, 3-D) in contrast with wrist pain, easily represented with 2-D PD? The author created a 3-D PD by tracing transverse plane MRI images from THE VISIBLE HUMAN PROJECT™. These are linked to typical 2-D PD, along with sagittal plane slices. This 3-D PD has been placed on the internet for access by the public and by health care professionals. The utility of this tool is unknown, though research and data on use should prove enlightening. Jerry developed the 3D Pain Drawing website to assist you and your medical practitioner with diagnosis by quickly and easily showing the location of pain that is superficial as well as the pain that is deeper. It is hoped that this tool will assist you in quickly and efficiently accessing appropriate health care.